Mr.R.Sampanthan, Mr.K.Thurairatnasingham, Mr.Mavai Senathirajah and Mr N. N.Raviraj, Jaffna District Tamil National Alliance (TNA) paid homage to the departed veteran Tamil activist late Mr.S.Pathmanathan, also known as Eelathunathan, who died last Wednesday in Colombo after a brief illness and funeral was held Sunday evening amid large crowd at the Trincomalee Hindu Cemetery, family sources said. Mr.Eelathunathan was an active member of the Ilankai Thamilarasu Katchchi (ITAK) and a founder member of the Tamil United Liberation Front (TULF). Mr.R.Sampanthan, Secretary General of the TULF and the parliamentary group leader of the TNA with TNA MP Mr.K.Thurairatnasingham paid homage on Saturday by placing a wreath. Leading members of the TULF in Trincomalee district also participated in that event. Mr.Mavai Senathirajah arrived in Trincomalee Saturday night and paid his last respects. 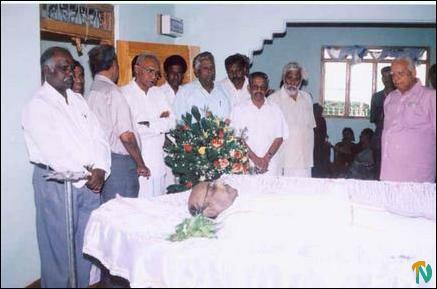 Mr.Raviraj arrived Sunday noon and paid his last respect. Mr.Mavai Senathirajah, Mr.N.Raviraj and Mr.K.Thurairatnasingham attended the funeral Sunday evening. Mr.Sampanthan did not attend the funeral as he was scheduled to meet Mr.Tadao Chino, President of the Asian Development Bank (ADB) Sunday morning in Colombo, sources said. The hearse carrying the casket covered with the TULF flag was taken in a procession from Mr.Eelathunathan residence, which is located in Abeyapura, Trincomalee through Inner Harbour Road, Thirugnanasampanthar Road, Huskision Road and Main Street to the Hindu Cemetery, sources said.